This album has been re-issued countless times in an extensive variety of permutations. Pictured here is the "deluxe 2 CD edition", released by Edsel Records in 2005. To avoid making this page too complicated we only list here the original release plus a few notable re-issues of the album. 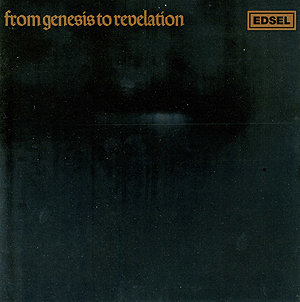 Released under the title In The Beginning, this re-issue warrants a mention as it included the Genesis tracks previously only released as singles for the first time. The third of these CD re-issues is a 2 CD set with the second CD containing a selection of demos and rough mixes along with the A and B-sides of the band's first two singles. All of the tracks on this second CD have been previously released - the majority of the demos and rough mixes being first released on the Genesis 4 CD set Archive 1967-75. The fourth of the CD re-issues warrants a mention as Ant was interviewed by music writer and journalist Chris Welch for the liner notes. It also includes the mono single versions of Where The Sour Turns To Sweet and In Hiding, which have not been included on the majority of the re-issues of the album.